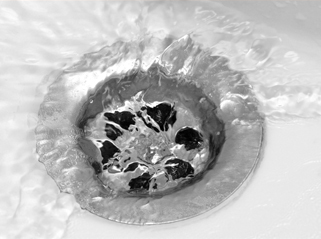 Many homeowners tend to use their garbage disposals to shred wastes and then wash it down the kitchen drain. They think that the drainage pipes will not get blocked because they don’t shred greasy food down the drains. This is not true because greasy and fatty food particles clog the pipes gradually. As more food particles are shred into the pipes, fats and grease reduces the diameter of the pipes making it hard for the food particles to pass through and this eventually clogs the pipes. Tree roots usually grows toward sewers due to the nutrient rich water. If you’ve trees growing near drain pipes, you may end up having clogged drains as the roots penetrate the pipes or grow around the pipes reducing their diameter and clogging them up. It is not easy to notice that the roots are causing a blockage until you’ve got a clogged drain. Therefore, you don’t need to plant trees near your drainage pipes and if you already have growing trees, it is advisable you cut them down before they cause a clog in your drains. However, if you already have this problem, you can hire a clogged drain specialist in Apache Junction, AZ to help you unblock the pipes. As hair passes through your bathroom drain, it collects as a ball in your drain and after some time, you may end up having a clog. The hair ball collects other debris passing through the pipe clogging your drain. Therefore, avoid shaving in your bathroom and remember to remove any hair from your shower, bathtub or bathroom floor to prevent it from getting into your drain.